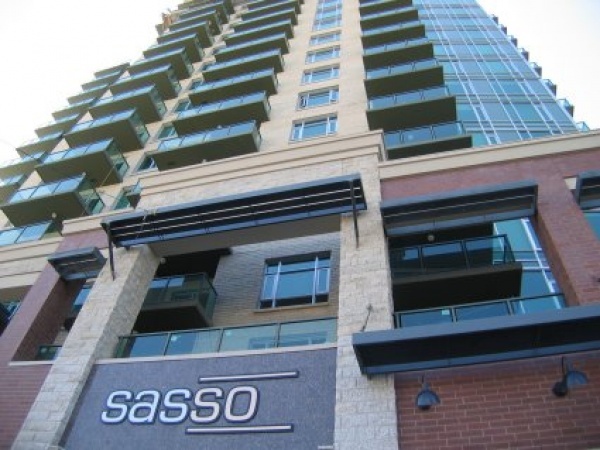 The first building of the two-city-block Stampede Station development, Sasso Condominiums is a stylish 24-storey tower of 192 suites plus ground-level commercial space and four levels of titled underground parking and 200 assigned storage lockers. Suites range from one-bedroom places of less than 600 square feet to the four two-level penthouse suites of up to 1,900 square feet. Layouts have interesting angles rather than only rectangular shapes and most balconies are of irregular projecting shapes. The podium's retail space is retained by the builder as an investment for commercial lease.With Sasso completed in 2006, crews moved next door (south) to Vetro, its 35-storey partner also built by Cove Properties of Edmonton, followed in 2008-9 with the first of two Nuera towers on the block to the north. Sasso and Vetro share a large outdoor patio and garden atop the ground-level retail spaces, plus a large two-level amenity area with a gym, a hot tub, billiard tables, and lounge. Many other buildings are tp rise on these blocks adjacent to the Stampede grounds and its LRT station, mixing residential, commercial, office, and hotel uses. A new Plus-15 pedestrian overpass is to connect the two blocks with the expanded Stampede grounds.Sasso is age-restricted to those over 18 years old, with retrictive covenants on all titles and that restriction written into the bylaws. The building allows no dogs to live on site, nor to visit the building. There is central air conditioning and forced-air heating. All suites have a natural gas outlet on the balcony and all balconies are of a generous size.Exterior windows and doors at Sasso are common property for maintenance and future replacement. I have on file all original sales literature, floor plate layouts and suite layouts plus the Condo Plan. The Condo Plan allows for some variation in the unit factors allocated to suites in proportion to their floor areas, so on behalf of buyers I crunch the numbers regarding the UF for a suite of interest. Usually such variations are minor. NO DOGS are permitted to live at Sasso Condos.